It’s all things Shaun the Sheep over here these days! I learned about the series only recently, but was quickly hooked. Why? Well, unlike most fast-moving-bright-lights-in-your-face cartoons for kids these days, Shaun the Sheep is claymation. For a truly fascinating look behind the scenes at what it takes to animate an entire claymation movie, check out this article: Inside the Aardman Animation Studios as Shaun the Sheep is Brought to Life. And now . 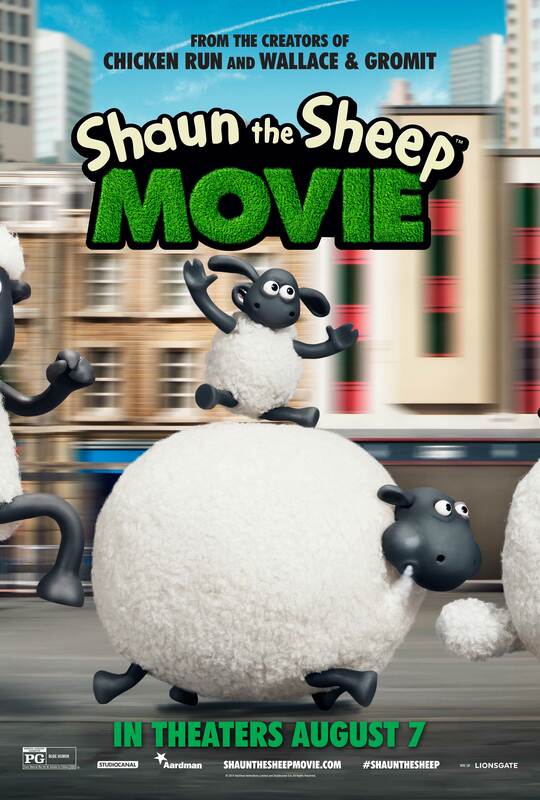 . . with less than two months until Shaun the Sheep, The Movie premieres in the U.S., we are getting excited! So who’s your favorite of the flock? I love Shirley because she loves food, and, well, I love food, too. You know what I bet Shirley would really love though? Being made of food. Or what about being made of food, eating food? I know she’d love it! And bet your kids would, too! 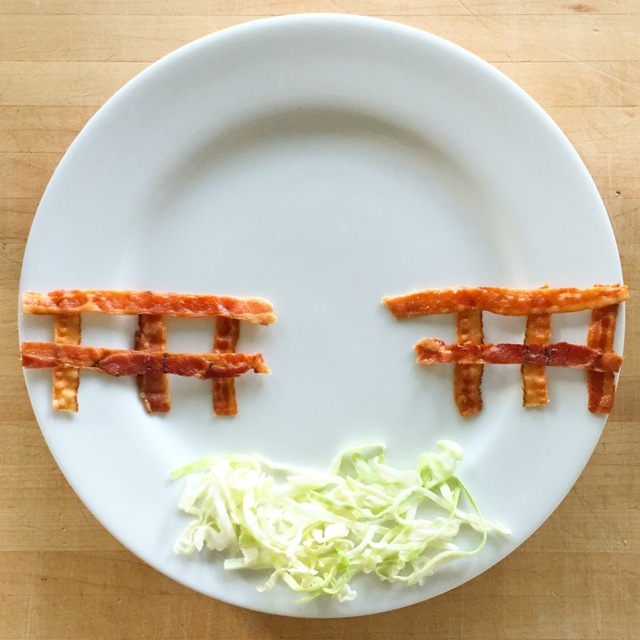 So if you’re in need of something to do with the kids this summer, food art is the way to go. 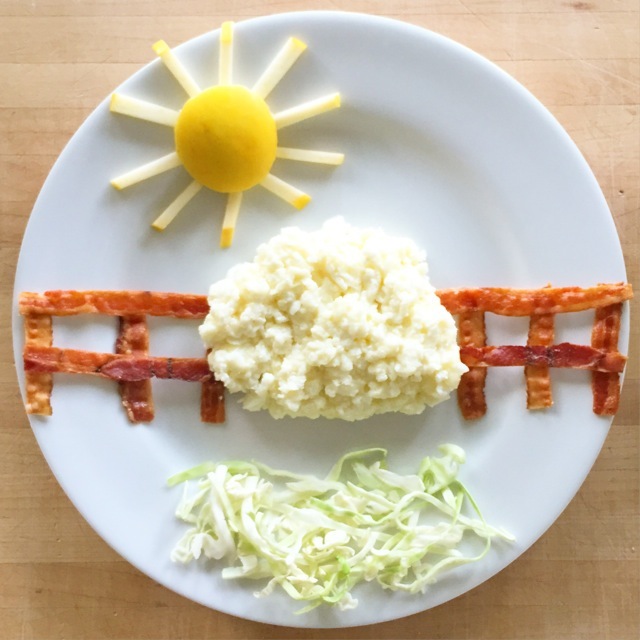 In addition to being just plain fun, food art is a great way to keep kids interested in their meal, and may even encourage them to try a new veggie! It’s worth a shot, anyway. Here’s how you do it . . . Using scissors, cut your bacon into thin, even strips. You’ll use the bacon to build a fence. Cut six pieces, each about two inches long, to form the vertical posts of the fence. Cut four longer strips to form the horizontal part of the fence. 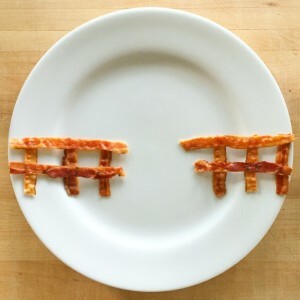 Place them on the plate as shown below. The gap in the middle of the fence is where Shirley will stand. Place the shredded lettuce or cabbage under the fence, on the bottom of the plate as shown below. This is the grass that Shirley will stand on. Using a circular cookie cutter, cut out circle out of the apple. This will be the center of the sun. Then use a knife to cut out thin strips of apple for the rays of sunshine. Place the circle and strips of apple on the plate as shown below. Now add your scrambled egg whites to the center of the plate. Using scissors, cut a face shape out of bread. Then cut out two small ears and two legs. Place the face on the egg whites, and the legs under the egg whites, as shown below. 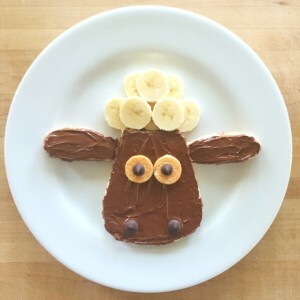 Use the white chocolate chips and mini chocolate chips to make eyes and nostrils. And . . . ta-da! It’s Shirley the Sheep for breakfast! 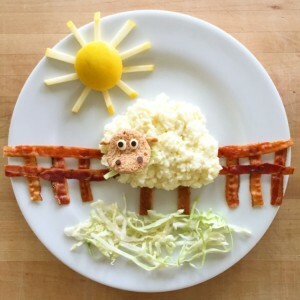 Hope ewe love it! 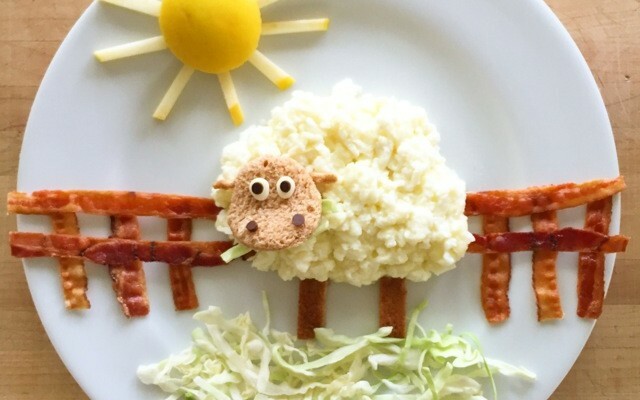 Think you might try making Shirley for breakfast? I want to see your creations! Post her on Instagram with the hashtag #ShaunTheSheep and tag @MarieSaba and @ShaunTheSheep so we can all enjoy everyone’s art!